Most quilters have ordinary quilting supplies at their finger tips. It is the unique kind that quilters are anxious to share. A short time ago a member of our quilters guild introduced a quick, easy and fun way to develop a set of quilting sandwiches for each members' reference library. To avoid duplicate squares, each guild member was assigned a unique kind of batting in which to make their quilting sandwiches using the batting that was assigned to them. Each member purchased enough unique batting to make ten 14-inch identical squares. They only needed to purchase one kind of batting but enough to make ten 14-inch squares. What a wonderful way to share quilting supplies! Because different batting gives different results you can see just exactly which of the 14-squares will give you the results you are looking for. Imagine taking the guess work out of your choice of batting for your next quilt. Aha! the power of one! Do the same exercise using different kinds of threads. Even different kinds of fabrics. And last but not lease...different kinds of needles. Everyone swapped one of their unique batting square with each of the other members; thus everyone walked away with ten different kinds of batting squares. Each guild member in return made sandwiches by basting together a top, a backing, and a different kinds of batting for each of their squares. Match the right size needle with the right quilting thread and hand quilt several straight lines, a few diagonal lines and last use a template with curved lines to complete the fabric sandwich. Use a variety of threads such as 100 percent cotton, polyester-cotton blend, rayon and metallic. Don't forget, threads can be swapped too. Add to your fabric sandwich a few examples of machine quilting stitches, using a darning foot when doing free motion quilting and a walking foot when doing machine guided stitching. On the Quilting Foot page we give you a quick review on the difference between a quilting foot and a walking foot. Next, using the free motion quilting techniques and the machine guided stitching technique, stitch a line with your sewing machine using different kinds of threads. 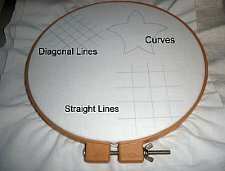 Once you have finished making your sample quilting square, using different combinations of stitches, needles, thread and equipment, make any notes directly on the sandwich using a fine point permanent marker to record the batting type, and thread and needle used for that particular batting square. Repeat this same exact process for each of the other nine batting squares. The object is to see what effect the batting has on your quilting stitches. Wash a few of your sandwiches a few times to check for shrinkage, bearding, appearance and drape. This is a terrific reference tool to be kept with your other quilting supplies. Refer to them often when deciding just how you want your quilt to look. The samples will also tell you just how flat or how fluffy the batting will be when used in a quilt. Keep the sandwiches in a resealable plastic bag and handy for a quick reference tool. The classic double wedding ring quilt dates back to the early 1800's and could take up to a full year to make. It was right up there at the top of the ladder for a difficult quilt to make. The one shown here was very easy and was made with Quiltsmart's printed fusible interfacing and it only took me a couple of weeks to piece together. Generally fusible interfacing is not pre-printed with a design or with anything for that matter. But when it is pre-printed with a design it takes on a different purpose. The design will aid you with accurate sewing and cutting lines to follow and will speed up the process. This technique eliminates the need to trace the individual pieces on your fabric, then cut each piece out, and last sew the pieces together to form the arc that achieves the curved piecing effect. Curved piecing and inset piecing is a difficult skill to master but this pre-printed fusible interfacing by the folks in Chanhassen, Minnesota makes child play of a double wedding ring quilt using vintage fabrics. Don't be afraid of this bygone era with hand-sewn pieces of fabric lovingly and laboriously crafted from watercolor construction. This is one quilting supply that makes your double wedding ring quilt easy! 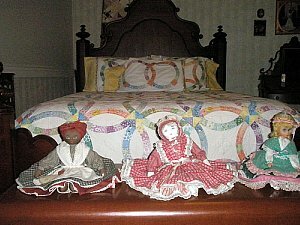 The finished quilt is virtually indistinguishable from the classics, but the techniques used to make them are radically different.